Input text: a 10 feet tall [brown] suitcase. a 0.15 feet tall 1st [venzuela] plate is in front of and -4 feet right of and -5 feet above the suitcase. it leans 90 degrees to the front. a 0.15 feet tall 2nd [prague] plate is in front of and -6 feet right of and -7 feet above the suitcase. it leans 90 degrees to the front. a 0.15 feet tall 3rd [greece] plate is in front of and -8 feet right of and -9 feet above the suitcase. it leans 90 degrees to the front. a 0.15 feet tall 4th [usa] plate is in front of and -10 feet right of and -5 feet above the suitcase. it leans 90 degrees to the front. a 0.15 feet tall 5th [london] plate is in front of and -12 feet right of and -6 feet above the suitcase. it leans 90 degrees to the front. a 0.15 feet tall 6th [rome] plate is in front of and -5 feet right of and -9 feet above the suitcase. it leans 90 degrees to the front. a 0.01 feet high and 3 feet wide and 2 feet deep 1st [paris] picture is in front of and -12 feet right of and -9 feet above the suitcase. it leans 90 degrees to the front. a 0.01 feet high and 3 feet wide and 1.5 feet deep 2nd [lasvegas] picture is in front of and -7 feet right of and -5 feet above the suitcase. it leans 90 degrees to the front. 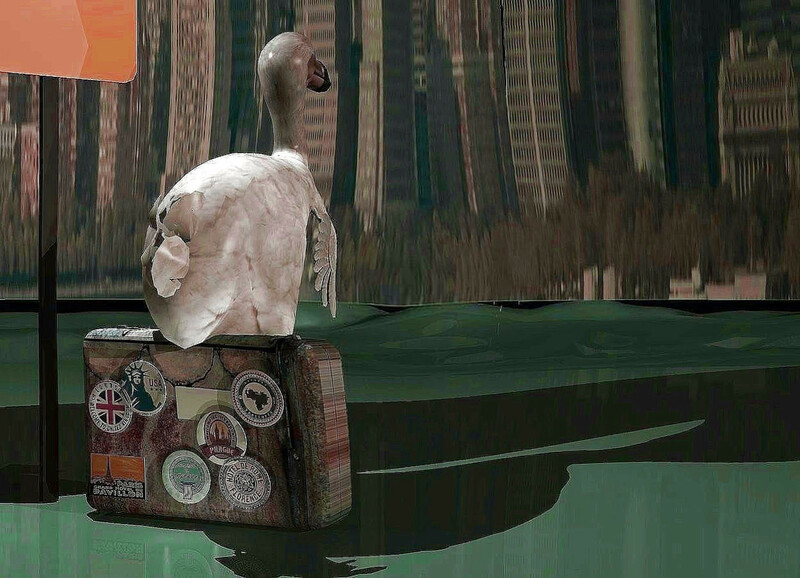 a 20 feet tall dodo is -5 feet above and -7 feet behind the suitcase.it is facing north. a 30 feet tall sign is left of the suitcase. it is facing southeast. it is dawn. a 1st white light is above and right of the sign. a 2nd dim white light is 2 feet in front of the suitcase. a 3rd dim white light is 1 feet in front of and -5 feet right of the suitcase. the camera light is black. the ground is dull ivy green. the sky is new york. it is 400 feet tall. this is a very well-traveled dodo. love the suitcase!